Good looks, workhorse performance and serious value for money. What’s not to love? Lovely looks with smart features, versatile tones and modern hardware choices. Fret polishing could be slightly smoother. Faith truly does deserve credit for the breadth and variety to its catalogue. Even the most cursory of looks at its website reveals a company that has just about every possible niche well and truly covered. Whether it’s the stripped-back, rugged appeal of the Naked series, the opulent and exotic tonewoods found on the high-end Signature series or the diminutive delights of the humble Nomad series - every single possible need is catered to, and often with wonderful results. So where next for the guitar builder that does everything? The answer to that question seems to be a new combination that seeks to take the purity and simplicity of the Naked series and jazz it up a little. As such, much of the Nexus’ features are inherited from the all-mahogany Naked Venus electro cutaway. The original is already a wonderful guitar, and so at £50 dearer this new version surely has to offer a few compelling reasons to splash that bit more cash? Quite so, as it happens. The biggest and most obvious change that Faith has bestowed upon the Nexus models is the new finishing options, which consist of two rather fetching new stains that enhance the solid mahogany body natural looks rather than paint over them. Our example is finished in ‘Cognac’ but the ‘Black Copper’ finish is well worth looking up on Faith’s website, too. 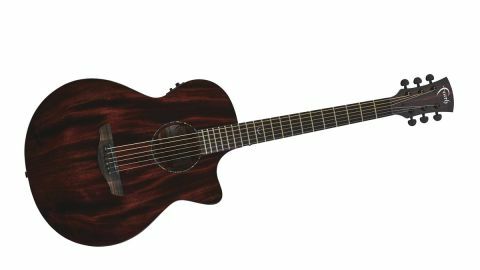 The Cognac finish is a little more subtle as it takes the natural reddish brown of mahogany and just makes it that bit deeper, darker and more dramatic, as if you’d taken a photo of the guitar and saturated it in post-production to bring the colour magically to life. It’s easy to imagine the wood having been taken from an old whiskey or cognac cask, making the name rather apt. The wood grain really pops as a result, aided by the silky smooth lustre of the expertly-applied gloss finish. For all that the new colours add to the visual appeal of the Nexus, the guitar isn’t overpowered by decorative appointments. There’s no binding to speak of, so the only other flourishes are the unmistakable ‘F’ logo on the 12th fret, an abalone rosette and further abalone dots on the ebony bridge pins holding the strings in place. The nut and tuners are pitch black, while the Macassar figured ebony fingerboard and bridge blend as beautifully as you’d expect. The look in general strikes a nice balance between austerity and flamboyance - refined and arresting without being ‘busy’. The Venus shape is as lovely to behold as it always has been - its relatively shallow body and easy curves make for a balanced fit on the lap and superb playability. This is a guitar that will suit any playing style and feel easy to play for all kinds of guitarists, but at the same time never feels generic in the way that so many similarly-proportioned guitars can, thanks to the striking and accomplished design. It’s familiar, accessible and inviting - just what you want when you pick up a guitar the first time. The Nexus isn’t just a pretty face, either; a Fishman Isys+ preamp and Sonicore pickup complete the feature set (gigging guitarists will also be pleased to find a second strap lock on the heel of the guitar), offering a plug‘n’play level of versatility that means you don’t have to keep the Venus’ good looks to yourself. It’s a basic but well-regarded unit, coming equipped with a built-in tuner plus volume, bass and treble rotary controls as well as a phase switch for keeping feedback under control. While the Nexus does so many things right, the only blot in its ledger is slightly rough finishing on the frets. It’s a common occurence on guitars in (and sometimes, above) this price range, but there is just a hint of that scratchy feeling when you bend strings, and so it’s worth mentioning for those that may wish to address that at some point. There are a lot of factors that come into play with an all-mahogany instrument. It’s easy for a such a guitar to sound a little honky and unrefined, limited in tonal range by a combination of tonewood, body shape and bracing design. The Nexus thankfully suffers no such ailment, and what you get is as pure an expression of the delights of mahogany guitars as you could possibly expect for under £1,000. The mid-push is there of course, creating a wonderful punchy presence that loves being played hard, whether that’s with a plectrum or fingerstyle. There’s plenty of snap and depth to chords and single-note runs alike, with most of the tonal focus on the mid and trebles. The low end is plummy and satisfying, but obviously doesn’t have quite the thundering presence that a larger body with different tonewoods would provide. Pleasingly, the Nexus is equally happy with a softer approach, revealing a depth of tone that belies its modest price tag and works for just about any genre you could care to play. Alternate tunings work wonderfully on this guitar, with a bit of open D proving an absolute joy. In our time with the Nexus Venus, the thing that struck us most was the fact that we forgot we were reviewing it. It’s just so inviting and effortless to play, and takes no time at all to feel like your guitar. It’s got to be one of the best all-mahogany six-stringers we’ve tried at this price, and we can see a lot of guitarists forgetting how much time they’ve spent in the shop before hurriedly reaching for their wallets. Minor fret-finishing issues aside, this is a wonderful instrument that sounds wonderful and looks a lot more expensive than it is, all without falling into the trap of looking gaudy and gimmicky. Faith has knocked it out of the park once again, and on this evidence, we can’t wait to see what niche they go for next.